The Rome-based agencies’ gender teams are recognized as leaders in the field of peer review – particularly when sharing experiences in implementing the UN system-wide action plan on gender equality and women’s empowerment (UN-SWAP). The UN-SWAP is in its third year of implementation. 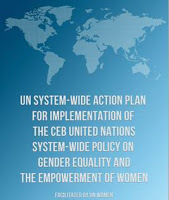 Almost 70 UN agencies now report on their progress with 15 indicators of gender mainstreaming. 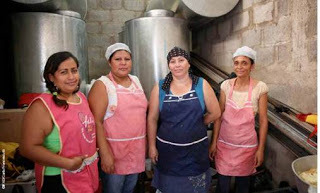 Nicaragua: women engaged in economic activities. Members of the UN-SWAP teams from FAO, IFAD and WFP met this week to share the results of their 2014 submissions. This practice of peer review is rare among the UN agencies, so it is interesting to reflect on why it works so well in Rome. It is relatively easy for the RBAs to come together in this way. The gender teams meet on a fairly regular basis throughout the year to organise shared events such as International Women’s Day – so it’s a collegial relationship. In addition, although the agencies work at different points along the continuum from humanitarian assistance through recovery to development, we share a common interest in agriculture and rural development, food security and nutrition – so we speak a common language. And finally we share many of the same members on our executive boards – so it is imperative that we are all familiar with the good practices of each agency. The trick to making the peer review work effectively has been to keep the process simple and flexible to accommodate the different needs of the RBAs. Before the annual review meeting, we record our results for the 15 indicators in one matrix, noting the levels of achievement, ranging from missing to approaching, meeting or exceeding requirements. There’s a colour code to indicate whether an agency has made progress on a specific indicator, remained unchanged from the previous year, or their position has deteriorated. When progress has been made (i.e. moving one level/two levels up) - What are the major reasons for the change, and what was the driving force for the improvement? When there was no change in the performance rating and/or the agency stays at the “approaches requirement” level – What is the reason and what should be done to move up to a higher rating? Any possibilities for support from other RBAs? When an agency downgraded a performance rating – What are the reasons for this change and what needs to be done to move up again? We conduct the meeting in an informal way to encourage free and open discussion, building on past peer review experience and relying on mutual trust and interest for enhanced collaboration. We follow up by sharing specific documents and other materials, identifying areas for further collaboration and making recommendations. UN-SWAP At this year’s peer review meeting, we were particularly interested in sharing experiences on WFP’s and IFAD’s use of gender markers to track resource allocation to gender-related activities and expenditures at the project level, FAO’s experiences of carrying out a gender audit and their assessment of and strategy for developing staff capacity. Innovative outreach activities such as IFAD’s monthly ‘gender breakfasts’ (with IFAD gender mugs), FAO and WFP’s inclusion of gender issues in media training, and WFP’s ‘lunch and learn’ events also attracted attention. The three agencies also discussed the ‘bigger picture’ of the UN-SWAP. How can we support each other in meeting or exceeding specific indicators that are proving more challenging? How can we make sure we maintain high standards? And what will happen beyond 2017 when all UN agencies are expected to have met or exceeded the 15 UN-SWAP indicators?